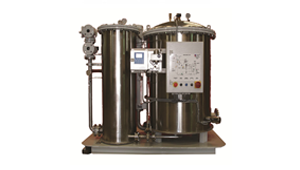 POSEIDON EVO unit contains two stages, the coalescer and the emulsion breaking unit. The coalescer works on a continuous mode and only when the oil detection monitor detects at the effluent of the coalescer oil content higher than 14ppm, the emulsion breaking unit begins its operation. The unit contains an effective hydrocarbon absorption material which ensures an excellent effluent quality with oil content much lower than the IMO requirements.